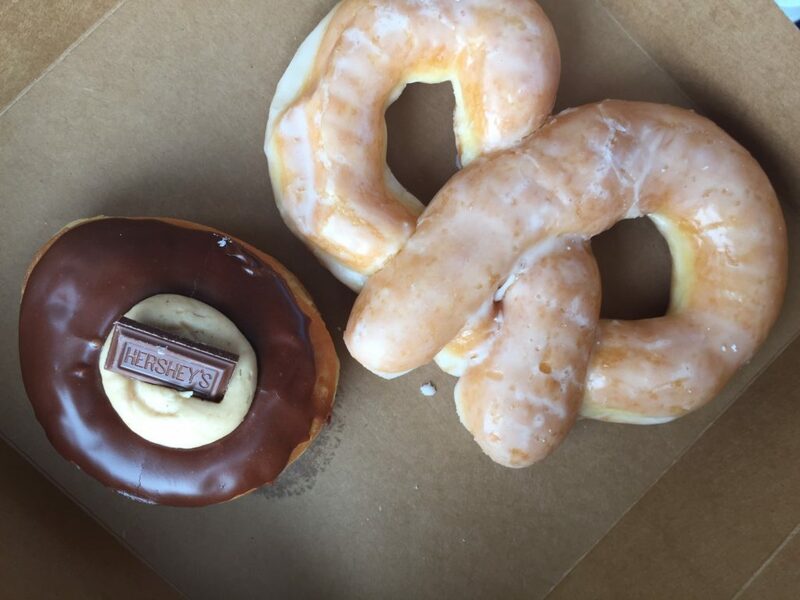 The Butler County Donut Trail: Warning: this post may cause a serious sweet tooth! Passport-style trails are currently popping up everywhere. 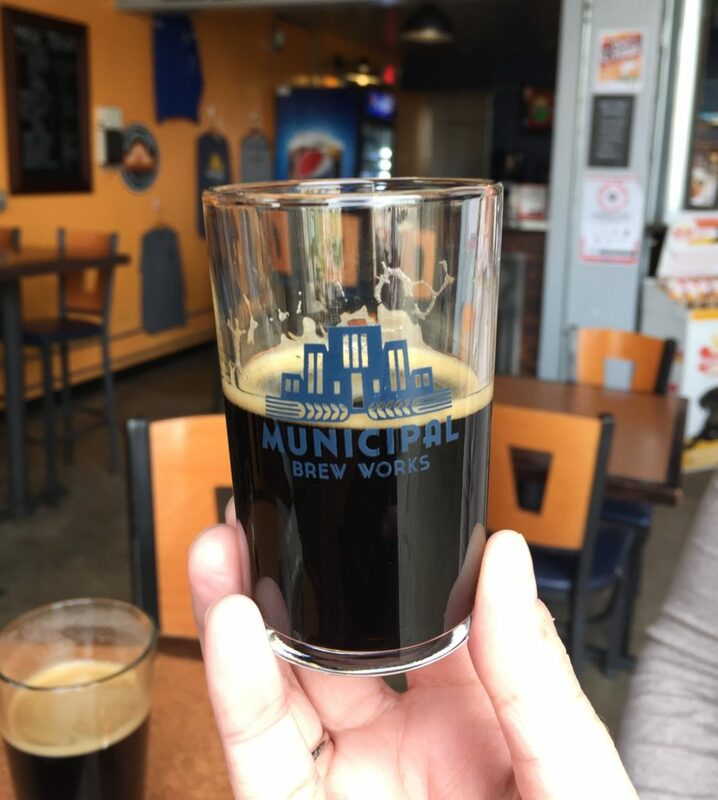 In Central Ohio, we have a coffee trail, Dublin’s Celtic Cocktail Trail, Hilliard just launched an ice cream trail, there’s the Licking County wine trail, and of course, the Columbus Ale Trail. Just a short drive from the capital city though, is one of the most magical, sprinkle-covered passport programs around: the Butler County Donut Trail. 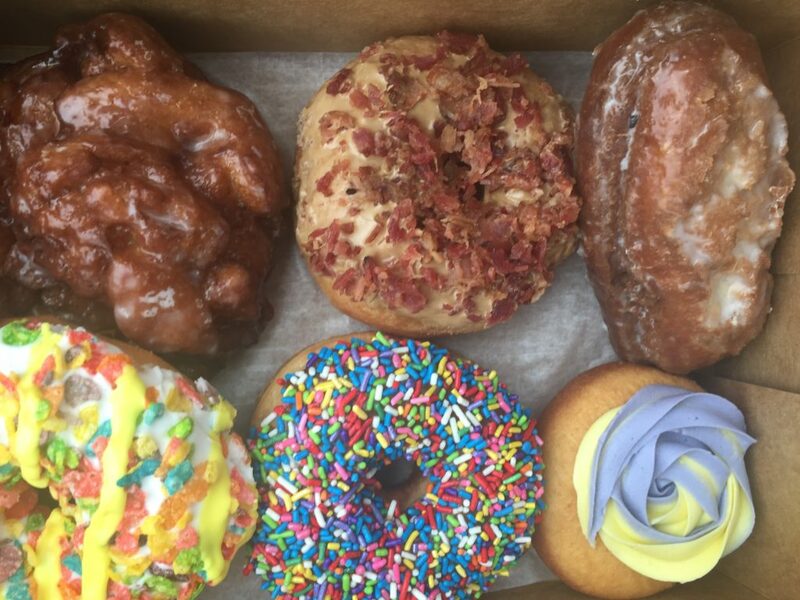 Located just north of Cincinnati, Butler County has your donut dreams made. The donut trail is a collection of twelve donut stops that you visit, purchasing a donut at each location. Begin the trail by downloading a passport here, or snag a passport at any stop on the trail. As you visit each stop, ask the cashier to stamp your passport. 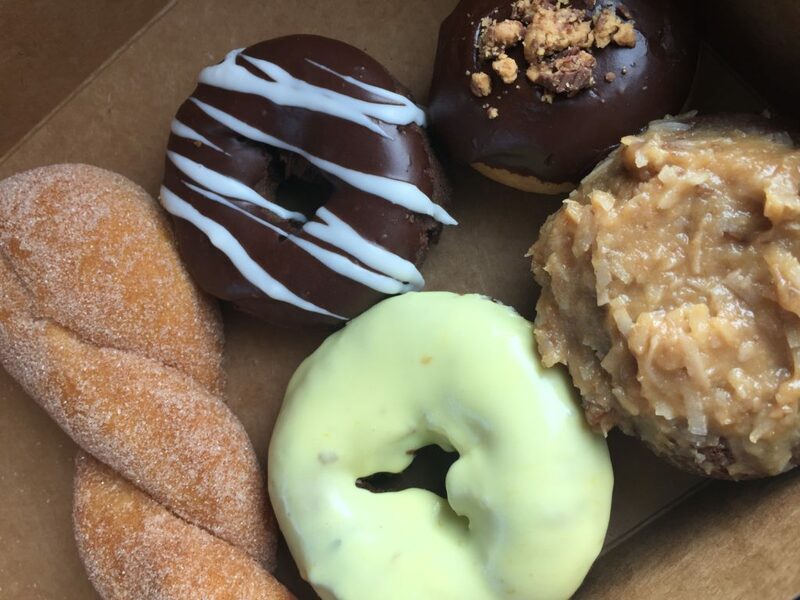 Once you’ve conquered every stop, turn your passport into the Butler County Visitor’s Bureau (or mail it in) and they will reward your donut-eating prowess with a t-shirt. 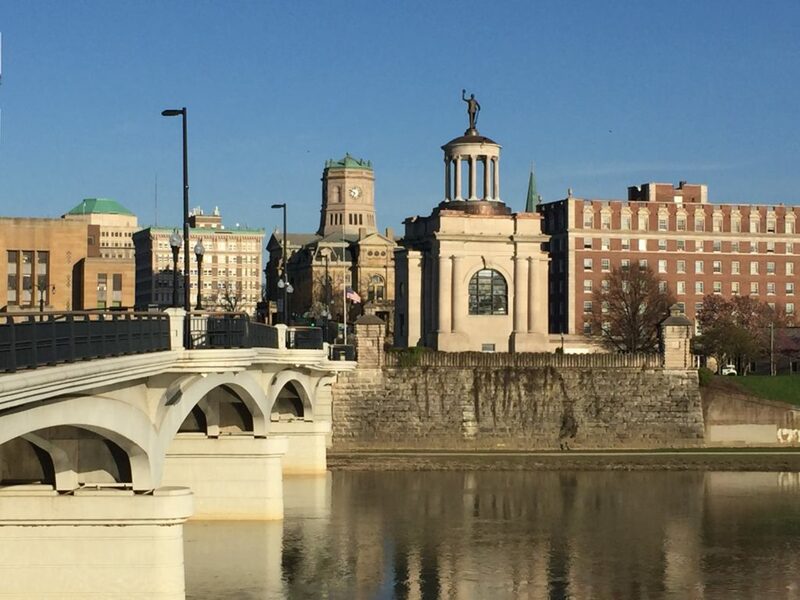 Because it’s also a quick road trip from Columbus, it’s easy to make a day jaunt to Butler County, knocking out a few shops at a time throughout the year until you’ve collected all the stamps. Just make sure to get an early start – some shops sell out by noon or even before. 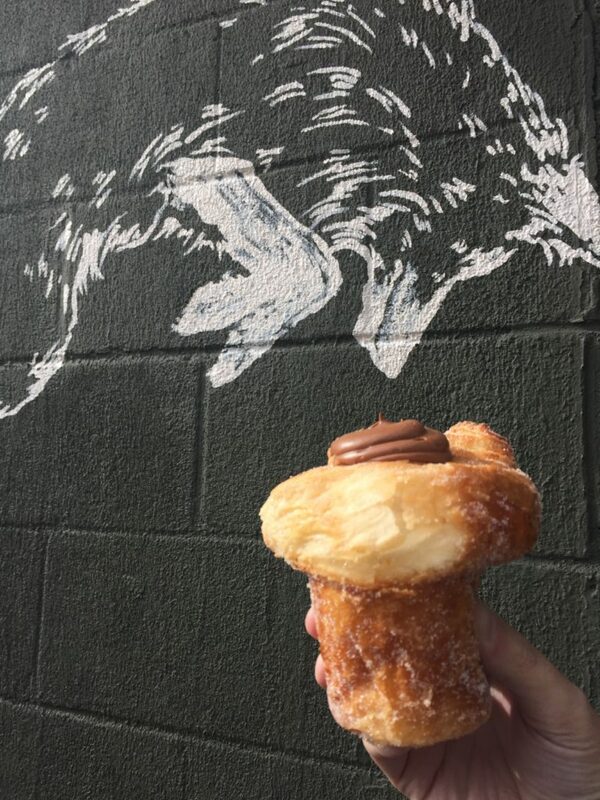 The most fun thing about the trail (besides the donut-devouring) is seeing that every shop had something special that set it apart, whether it be the owner, the theme of the shop, or the unusual varieties of flavors offered. Some were old-fashioned mom and pop spots, while others were modern and Instagram-ready. During my journey, I had the most scrumptious and unadorned yeast donuts and basic French crullers. 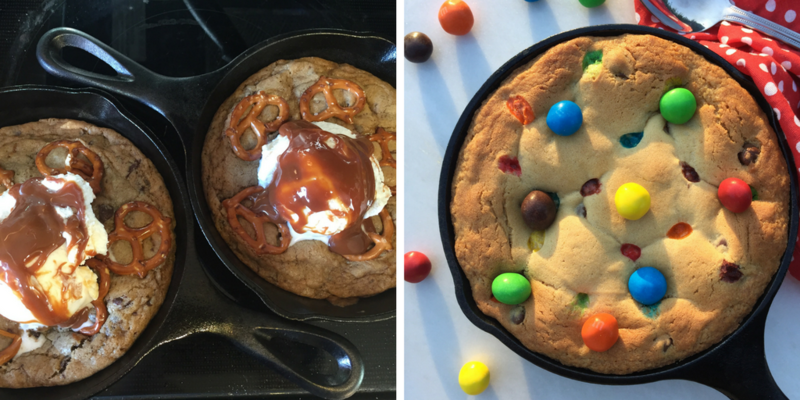 However, I also gobbled up some crazy versions topped with candy ingredients or Fruity Pebbles cereal; there’s appeal for both pastry purists and the most adventurous sugar lover. 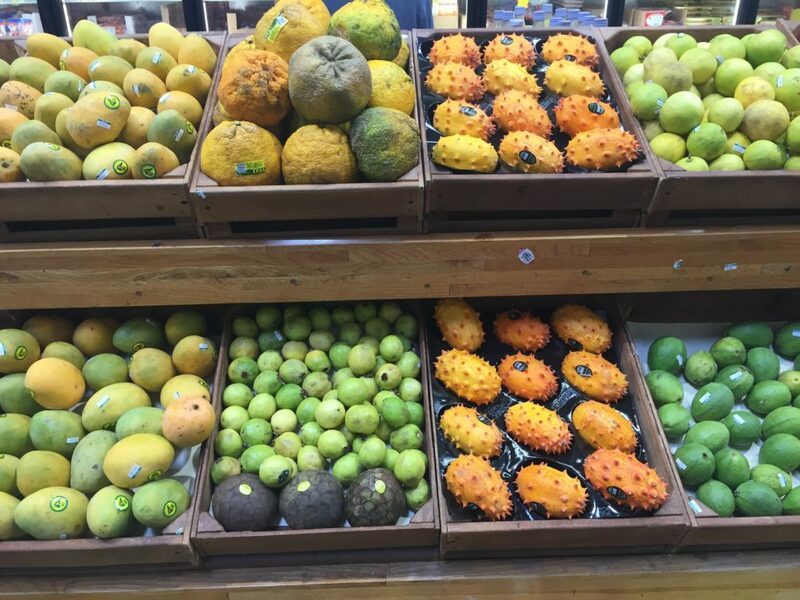 Some locales were in the ‘burbs, others were near commercial areas, but all were delicious. 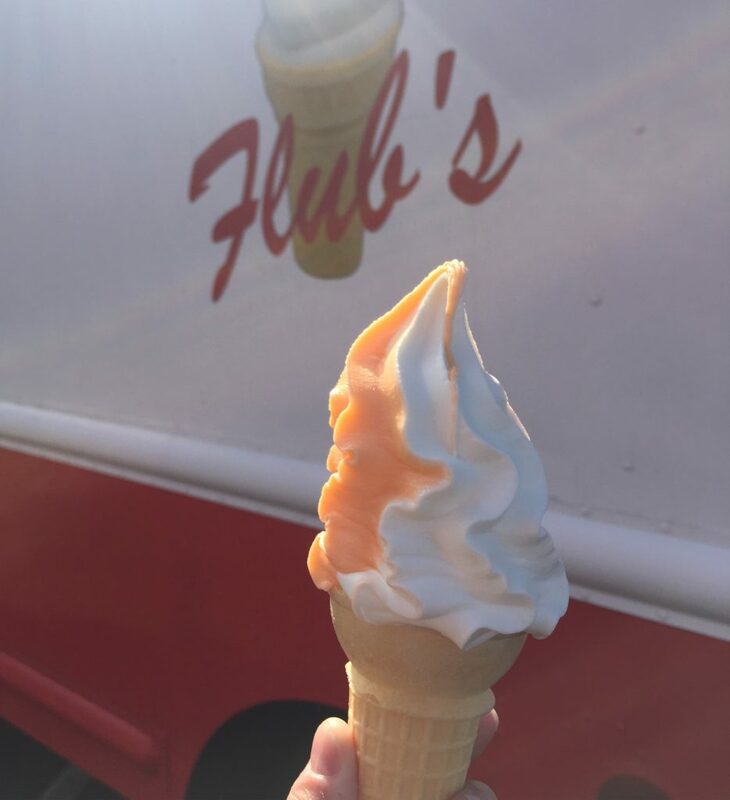 Home to some of the most creative and colorful goodies on the trail, Holtman’s features a plethora of flavors, from maple bacon to Lucky Charms, or from heavily sprinkled and Fruity Pebble-laden. This stop is also located around the corner from IKEA, so pop inside afterwards to walk off all those donuts! The retro vibe in this Hamilton joint puts you in a good mood at once, and if the shop’s atmosphere doesn’t, Kelly’s donuts will. 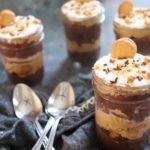 The creamy, rich peanut butter filling in the Reese’s-esque donut will make you melt, and there’s nothing to not love about the s’more concoction sprinkled with graham cracker crumbs, mini marshmallows, and a chocolatey drizzle. This cheery pink Trenton bakery is small, but it’s making some mighty tasty donuts. The turnovers, yeast donuts, and especially the cheesecake donuts were all a hit. The Cherry Cheesecake = tangy filling + graham crumbs + fruit pie filling. 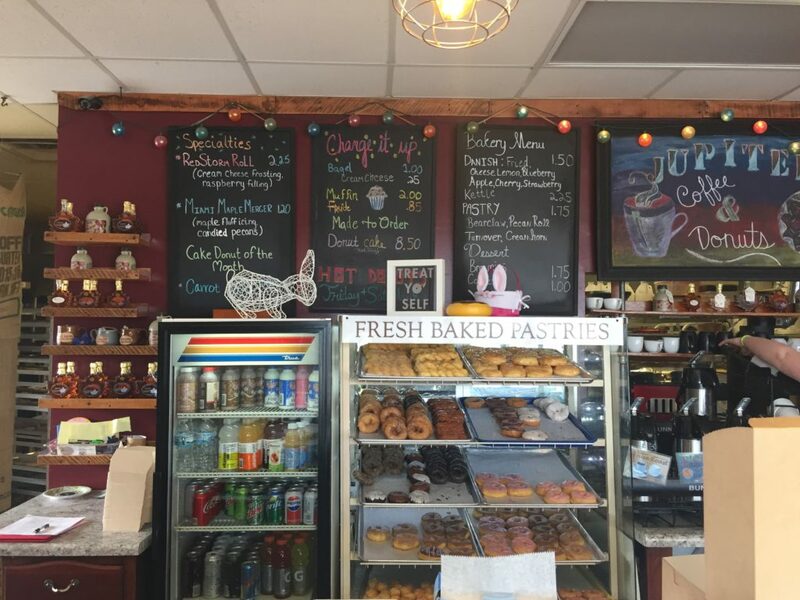 Situated up the street from Jungle Jim’s, Jupiter is nice place to have a coffee and unwind…with more donuts! They do a monthly seasonal donut, which during my visit was a heavenly carrot cake creation. The cream cheese inside out donuts and sprinkled versions were sampled winners too. 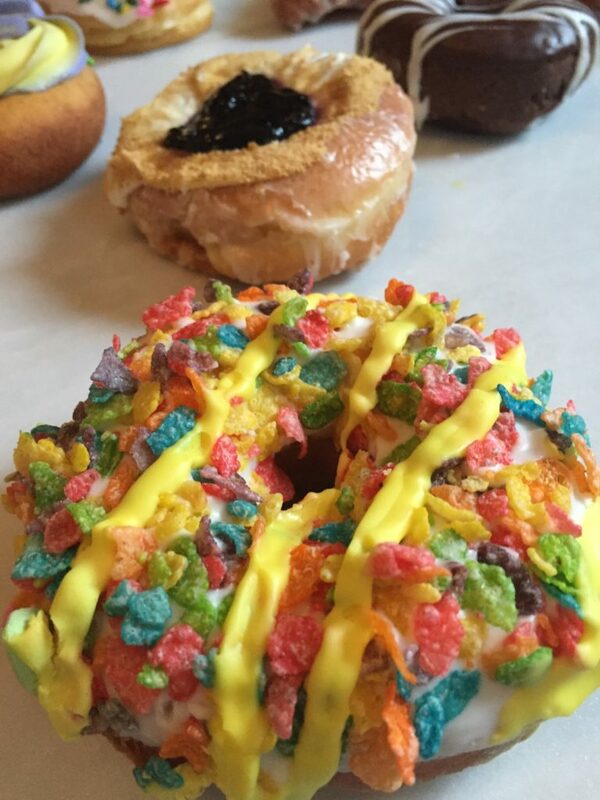 Milton’s Middletown shop had a wonderful mix of interesting donuts – another Fruity Pebbles offering, barely cooled glazed rings, devil’s food donuts, and super-friendly folks behind the counter. My favorites though, were the giant glazed croissants. Ross Bakery churned out one of my favorite traditional donuts of the trip – a massive yeast donut the size of my face, perfectly tender and shaped like a soft pretzel! Also on the menu: a buckeye-inspired chocolate peanut butter treat topped with a mini Hershey bar. Stan the Donut Man, the name says it all. Stan is doing donuts old school, in the best possible way. 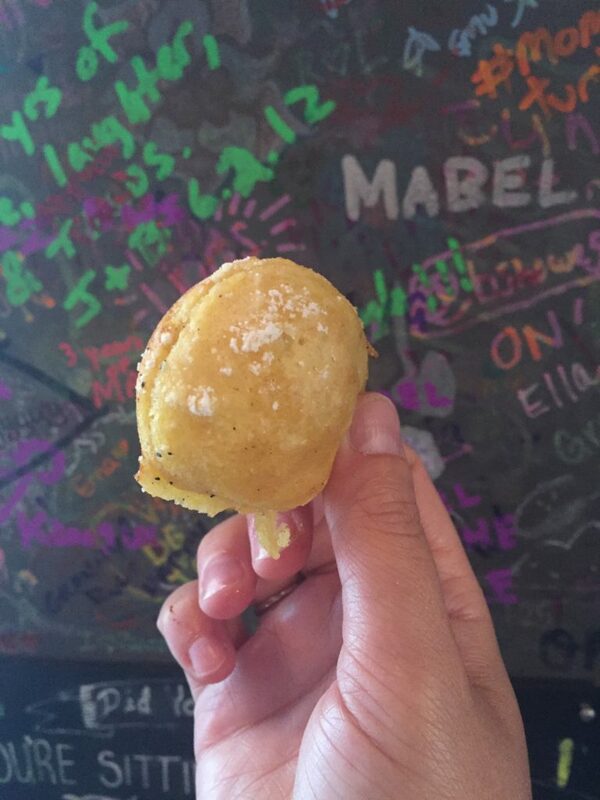 I’m currently drooling as I think back upon the pineapple fritter (who knew such a thing existed?) and the Davey Crocketts, maple iced mini cinnamon buns. I knew the line out the door at The Donut Spot was a sign of good things to come. 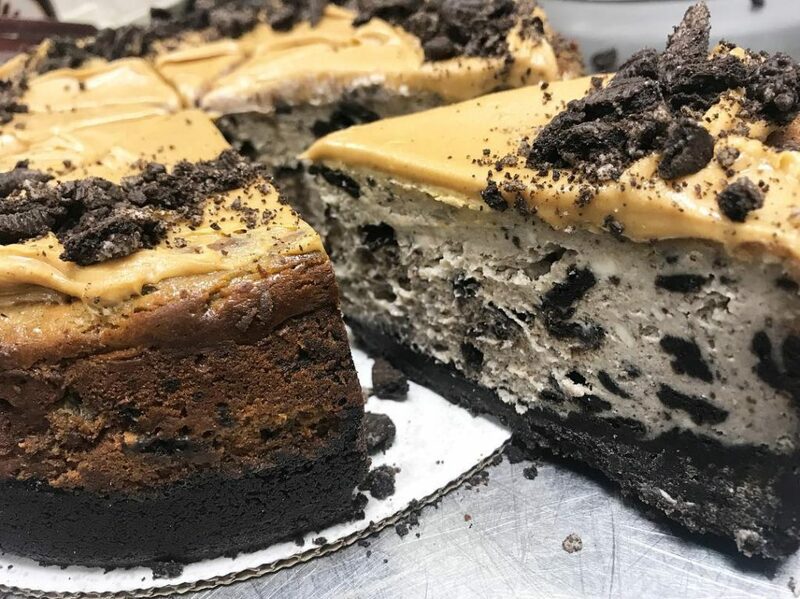 Cookies and cream, Bavarian cream, and cream cheese filled donuts all await at this Fairfield bakery, but go for the “clunker,” a dense, lightly glazed mass of cake donut hunks. Simple and divine. 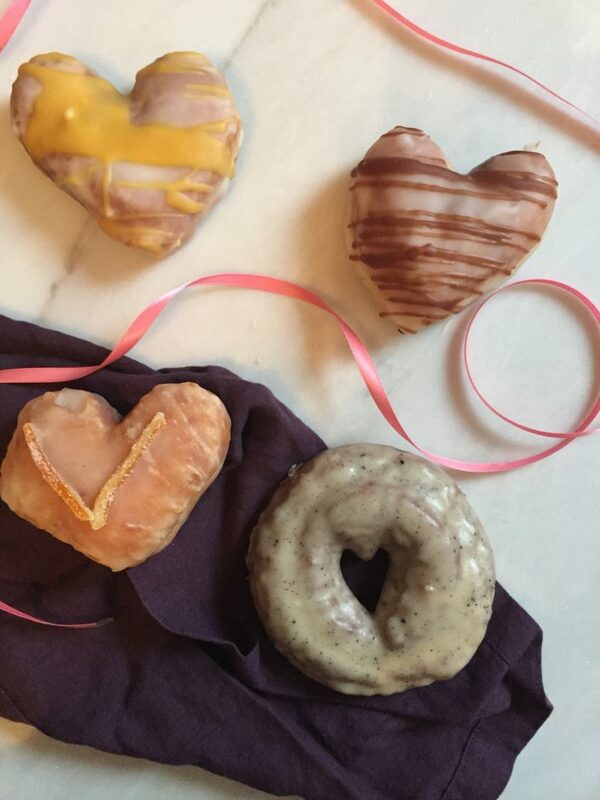 Tucked in a small corner of West Chester, The Donut House is dishing up heart-shaped donuts, donuts iced to look like baseballs, and even some with crushed Oreos. Best of all: there was a chocolate-dipped one with Butterfinger pieces on a puffy dough that I got to take home. 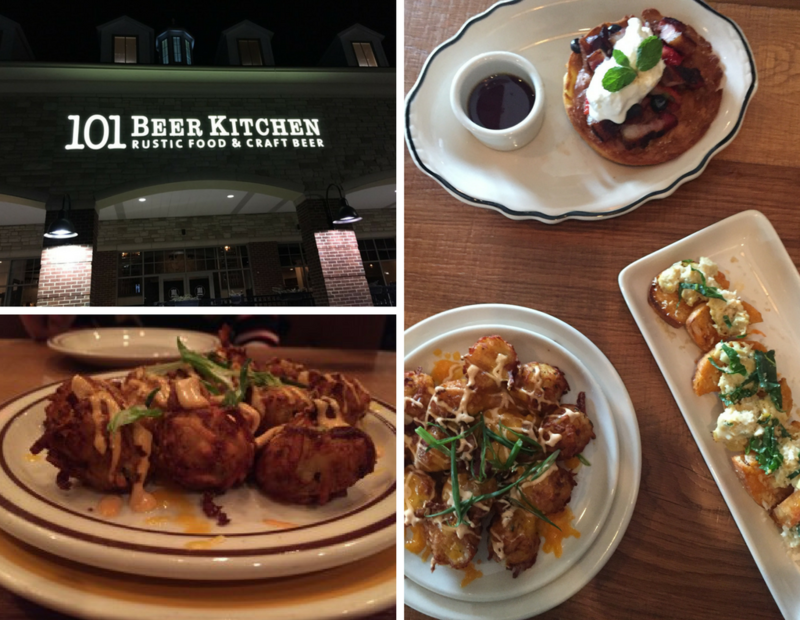 This Hamilton locale boasts a fun mix of traditional and crazy flavors. I loved the cinnamon twists and the lemon blueberry, but the German Chocolate’s ooey gooey coconut topping captured my heart. Located in downtown Middletown, this is the only required passport spot I couldn’t visit, since they were closed on Sundays. However, locals gushed over Central Pastry to me, especially their cakes and the tiger tail donut, a thin and twisty delight. 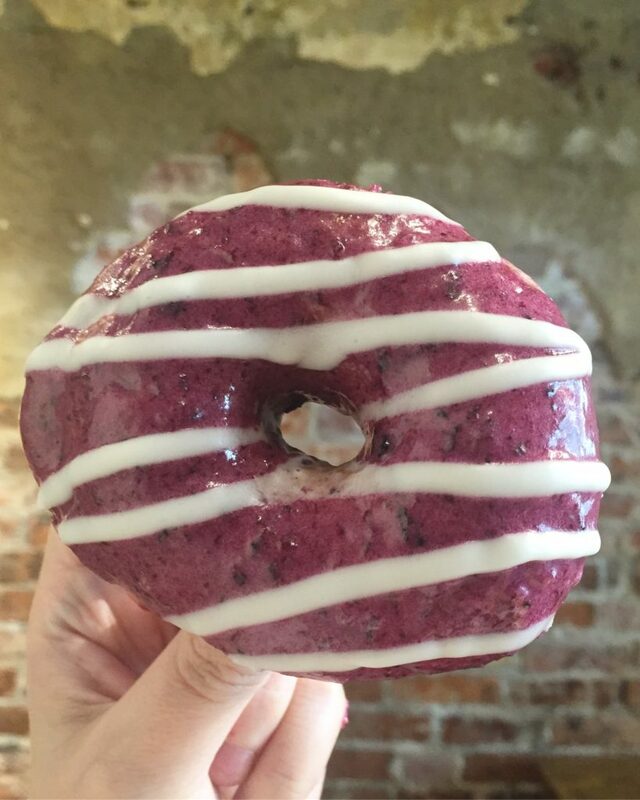 This spot comes pre-stamped on your Donut Trail passport, because it’s a little out of the way. 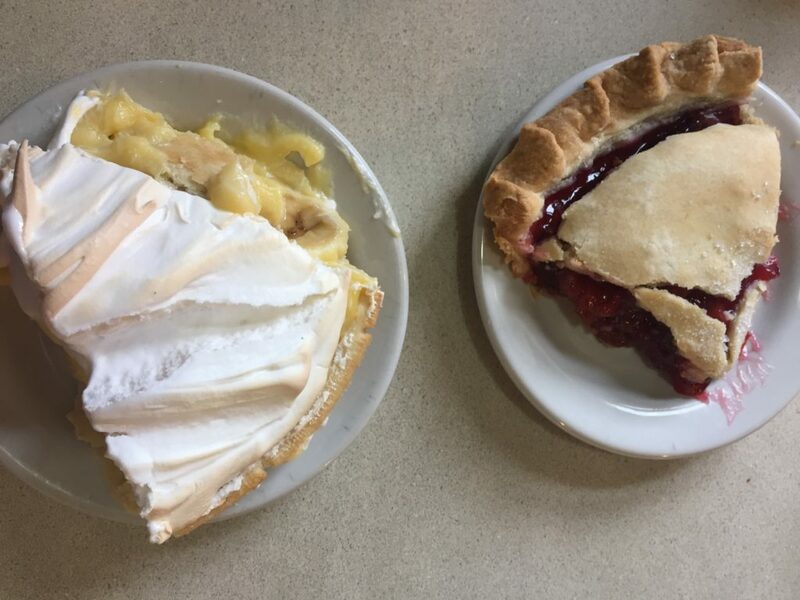 I didn’t make it to the Oxford favorite on this trip, but Miami University students rave about these kettle-fried classics. Bonus: score a dozen donut holes for just $2! Ready to hit the trail? Find out more information about the Butler County Donut Trail here: https://www.gettothebc.com/. The Visitor’s Bureau site can also give you ideas about other activities to do while you’re in town, since you’ll (probably) want to do other things besides eat during your journey. 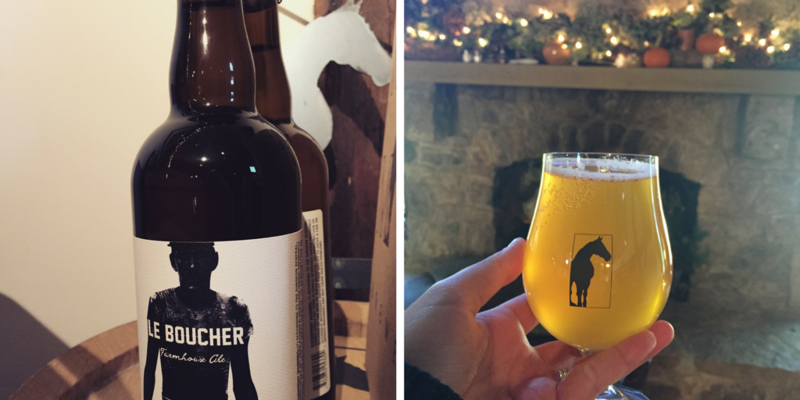 Stay tuned for part two of my Butler County trip next week, featuring some of the best spots to dine and drink in Butler County. Have you completed the Donut Trail yet? 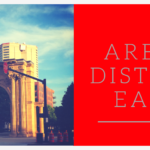 If so, let me know your favorite donut spot in the comments below! Disclosure: The Butler County Visitor’s Bureau hosted me on the Donut Trail, in exchange for an honest blog post. All opinions are my own. Marble. Columns. Ancient-looking relics. This isn’t a description from a trip to Rome, but just a few features of the upstairs bar at Veritas. 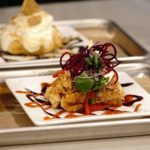 I first wrote about my lovely experience with Veritas here, when the innovative restaurant was still located in downtown Delaware. But Veritas has settled into the capital city, in a much larger space with the same creative cuisine and not one, but two bars. 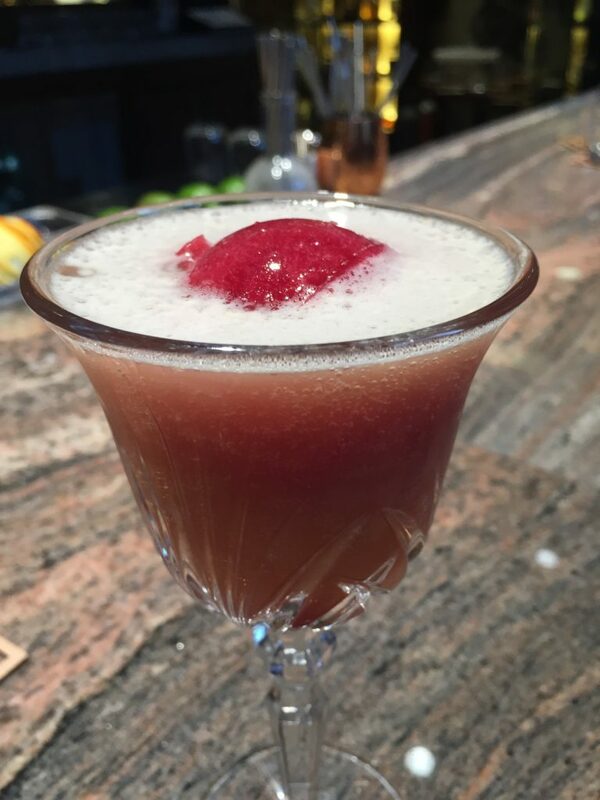 Begin your Veritas Columbus experience by partaking in a beverage at the marble-laden upstairs bar. Ask the staff to guide you there; it’s tricky to find if you aren’t sure where you’re headed. Because this area was the former Citizens Bank, there are plenty of historic touches, such as the old safe and mechanical features, as well as enormous windows and opulent niches for lounging. The cocktail offerings strike the impossible balance of elegant and delectable, with classic drinks and unique libations up for grabs. I can’t get over the beauty of The Sun Also Rises, sporting a blood orange ice sphere and ginger bourbon that I’m dreaming of as I type this. 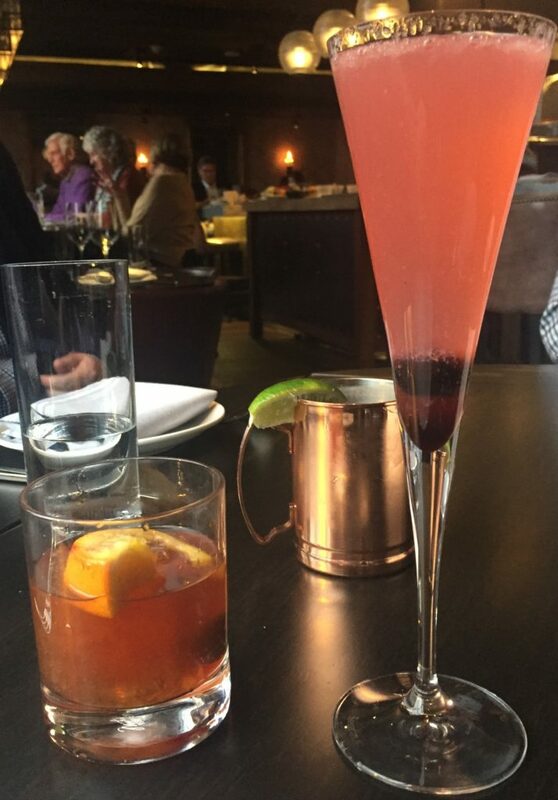 Make sure you finish imbibing before heading down for dinner; your cocktails can’t leave the upstairs area. The downstairs dining space is more modern and simply decorated, but also has a small bar and a cozy atmosphere. 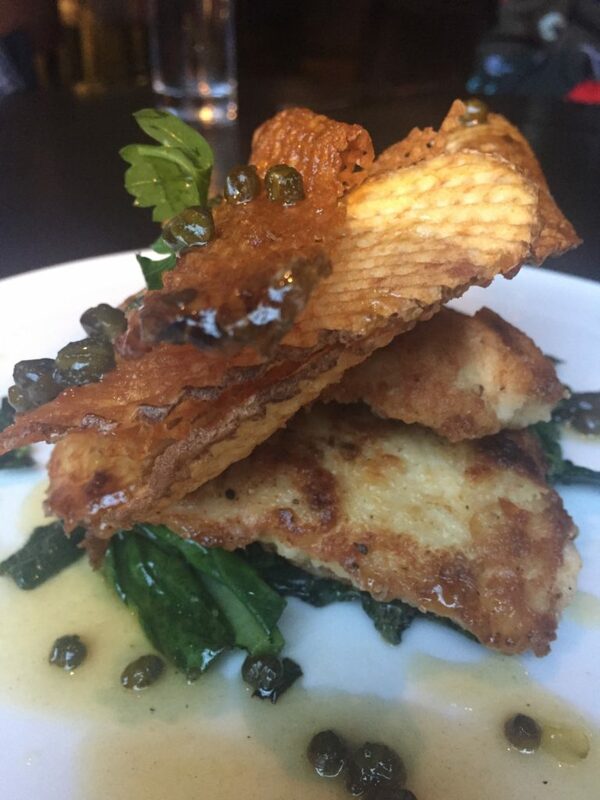 Small plates for sampling are still the focus at Veritas, but the setting is now grand enough to match the menu. Many of my Delaware favorites remain on the menu (I’m looking at you, bacon risotto). I won’t rehash the food too much from the previous post, but I have to mention a few things before closing. The shishito peppers are a great snack to start, coated in a rich miso cream cheese and a sprinkle of ever-trendy everything bagel spice. 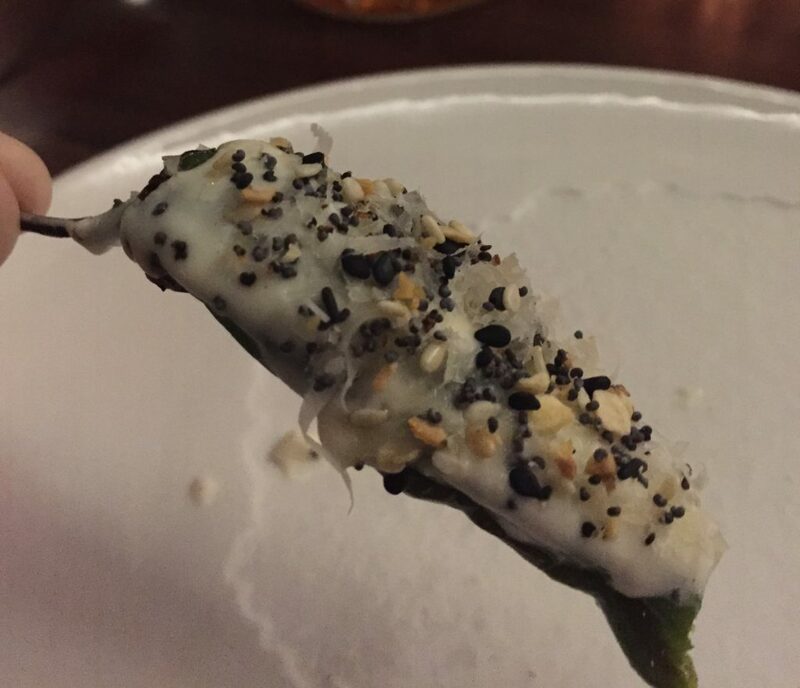 One of every ten peppers are spicy, so it’s fun to play pepper roulette, wondering if your mouth will be on fire with every new bite. The flavor-packed Brussels are as divine as ever, and the craveable chicken wings with blue cheese foam manage to be both ridiculously crispy and fall-off-the-bone at the same time. 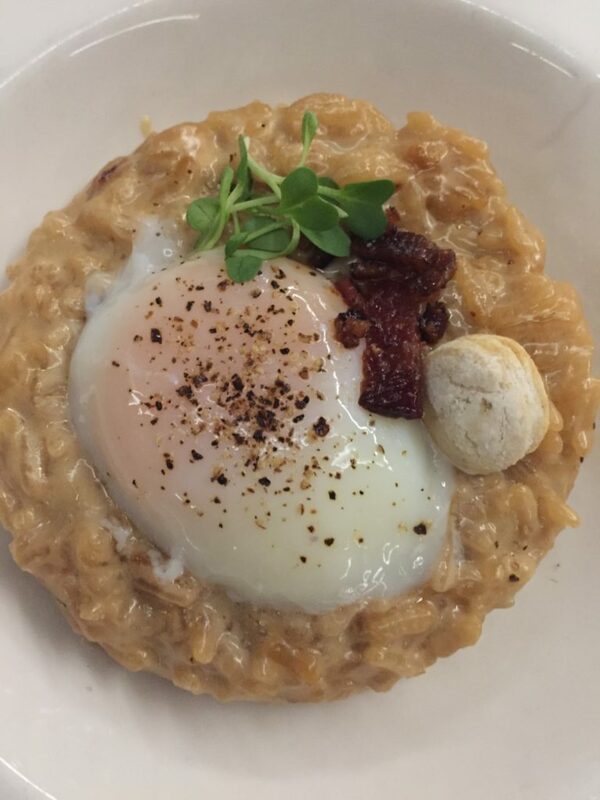 Lastly, be sure to save room for the aforementioned risotto, boasting bold bacon notes and an unctuous oozing egg that is both rich and comforting. Have you visited the new Veritas locale yet? If you were as impressed as I was, let me know! 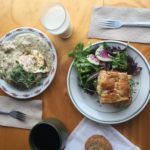 It took a long time for Cravings Cafe to relocate from their original home in Italian Village to their current downtown digs. But having finally made it to the new site of the breakfast and lunch hot spot, it was entirely worth my not-so-patient waiting. Cravings is still on the smaller side, but don’t be shy about ordering your meal ahead or getting it to go. And although the shop isn’t huge, there are fun prints on the lovely exposed brick walls and it’s a cozy place to sip your morning joe. There are so many menu items to discuss, but I’ll begin with brioche. The buttery dough is the base of cinnamon rolls, burger buns, and French toast at Cravings, and the stuff is sheer heaven. It’s even used in some unexpected ways. For example, the bronuts from the previous locale are still on the menu. Don’t be afraid, this isn’t a fraternity term; a “bronut” is a mashup of “brioche” and “donut.” Truly the best of both worlds, the bronuts are thick, chewy, and not too sweet. The flavors of this treat change often, ranging from blueberry to funfetti sprinkled to cinnamon sugar. They’re not available every day and sell out quickly, so call ahead to ensure you snag one of these beauties for yourself. For main dishes, I’m not even the biggest fan of chorizo, but when I tried my husband’s breakfast burrito, I begged him to go halfsies with me and split entrees. This monster wrap is bursting with green chile chorizo, scrambled eggs, crispy taters, cheese, and salsa with just a hint of heat. 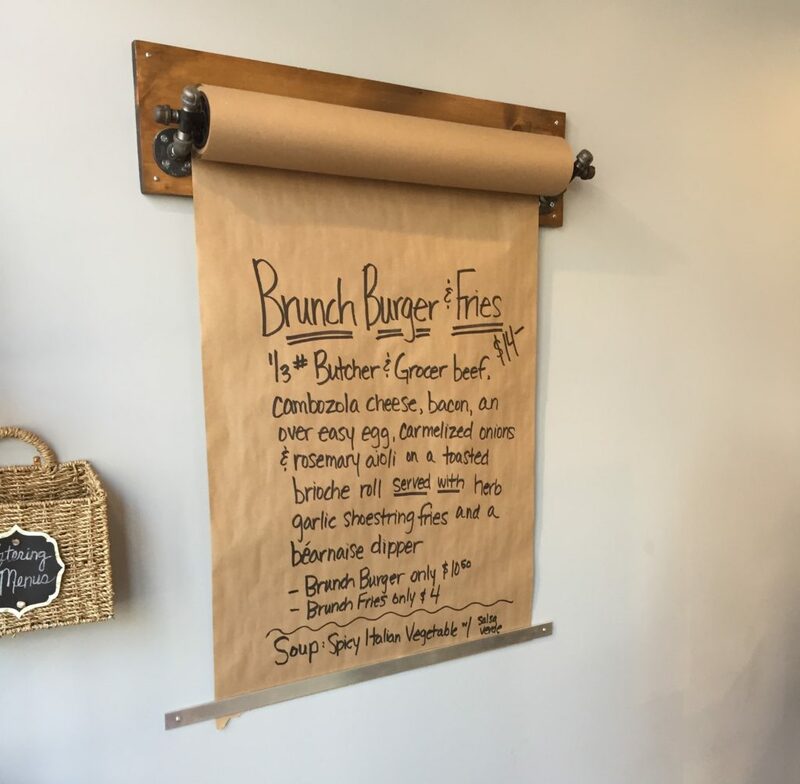 The falafel burger is also tempting, or go traditional and try the Breakfast Roll, a morning sammie that hits all the right notes: thick bacon, a fried egg, cheddar, and rosemary aioli on the signature brioche bun. Add the Greek potato hash on the side for the ideal savory side. I would be remiss if I didn’t mention how wonderful the daily specials are as well. These limited offerings are an ever-changing swirl of brunch entrees, such as loaded potato soup or a pork torta filled with braised pork, Swiss, pickled red cabbage, jalapenos, and tomatillo avocado salsa on sourdough bread. 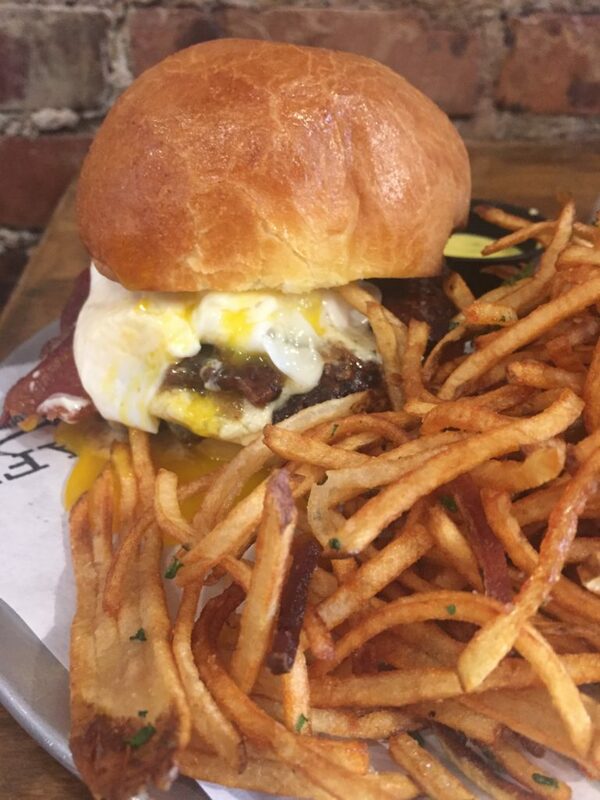 My last visit featured a brunch burger: locally butchered beef, cambozola cheese, a drippy egg, caramelized onions, and rosemary aioli, all on a house brioche bun with shoestring fries on the side. Just go ahead and order two if you see this on the menu. Cap off your visit with a just-baked cookie or muffin, they’re just as craveable as everything else. Or pair your meal with a Thunderkiss coffee; I must recommend the coconut cream cold brew variety. 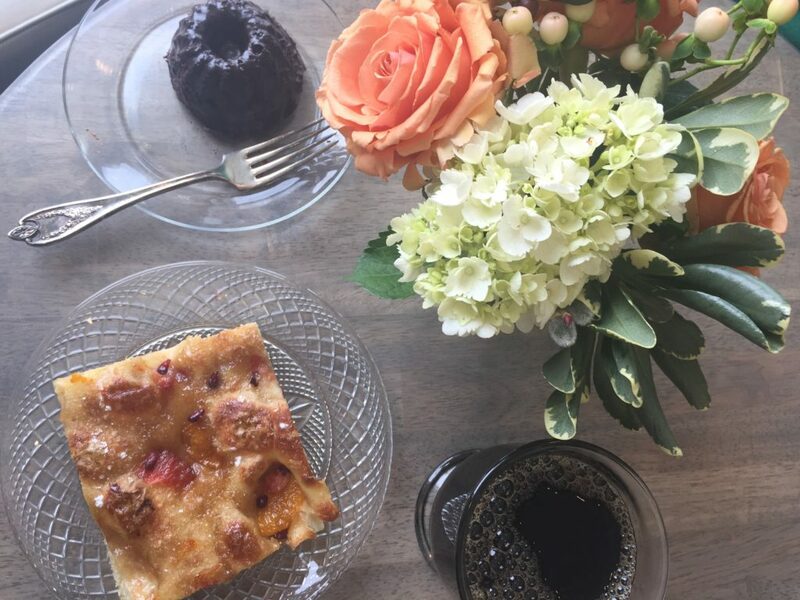 Have you tried Cravings Cafe yet? Tell me your favorite thing to order by sending me a tweet! 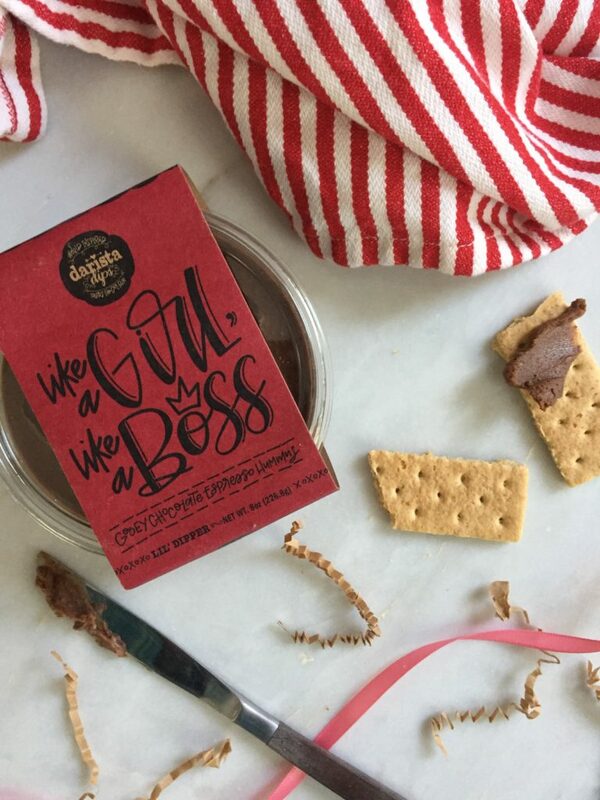 When I picked 5 of my favorite cocoa confections for a Valentine’s Day post earlier this year, something horrible happened. It was too hard to pick just five local items highlighting chocolate. So, here we go again! 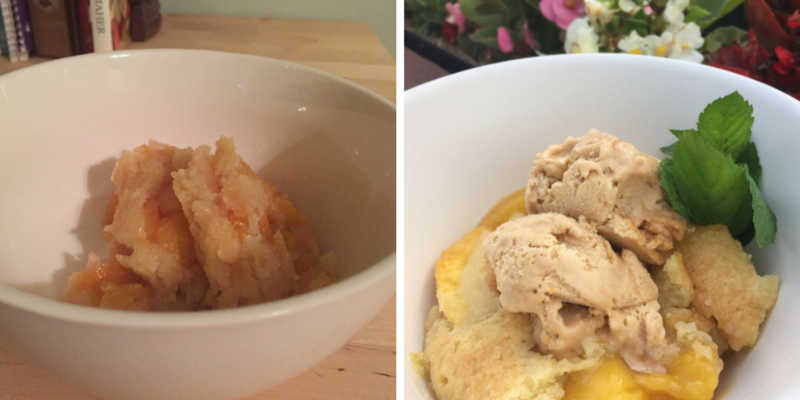 Below you’ll find a few more of the sweet treats that I love best. My husband is cheesecake-crazy, but I’d never been an aficionado until I sampled The Cheesecake Girl’s cheesecake. 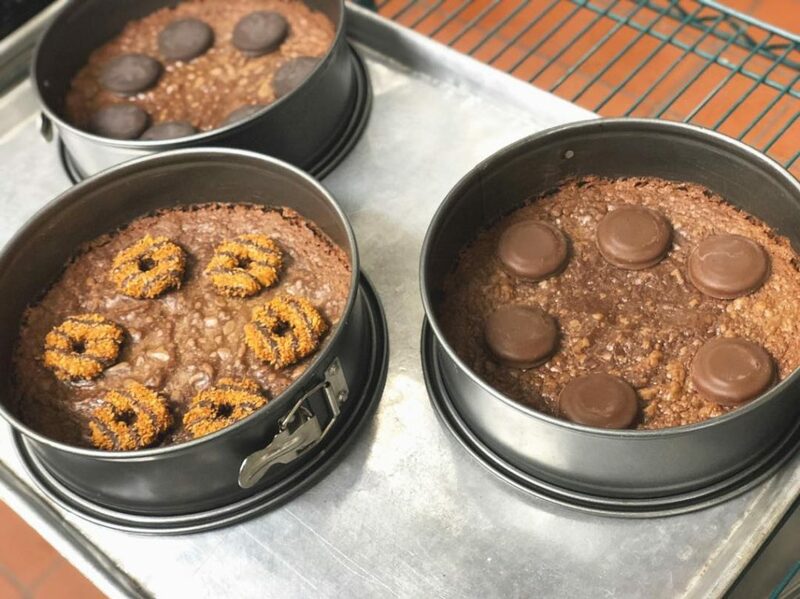 Try all kinds of chocolate-packed types such as puppy chow, Oreo, and even brownie. 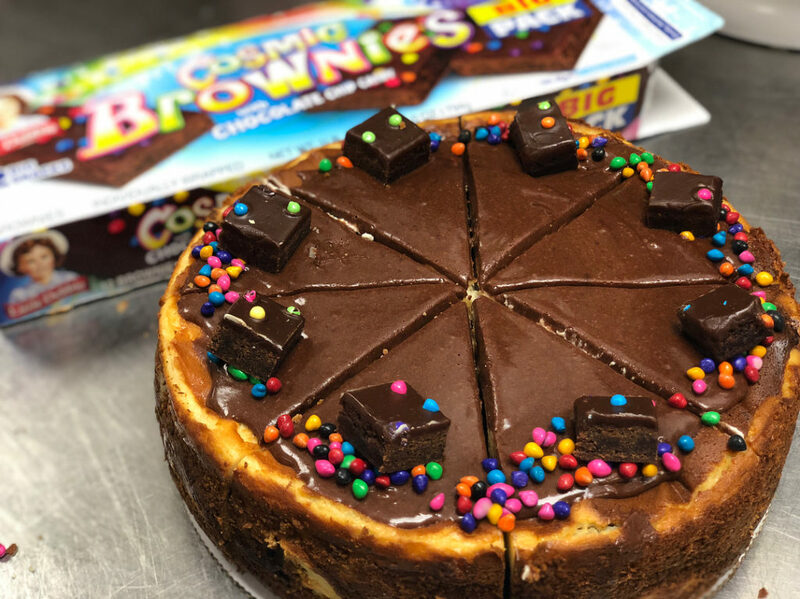 You can also custom order your own cheesecake with all the chocolatey toppings you can imagine; think Reese’s cups, ganache, and cookie dough. 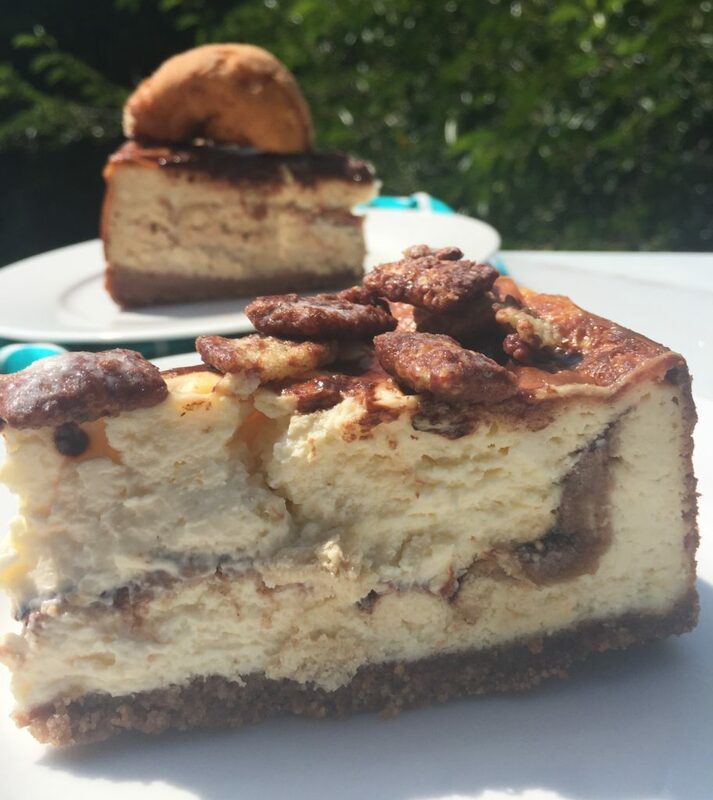 Find Sam and her cheesecakes at North Market pop-ups, Local Roots and Smidge and Pinch in Powell, and at all kinds of pairing events. While I await the opening of Tupelo’s Worthington shop, I’ve been stalking their trucks all around town to swipe their Chocolate Cremeaux donuts. This pastry is stuffed with a deep, dark chocolate custard, dipped in glaze and then drizzled with more chocolate, all adding up to a sugar-lover’s dream. 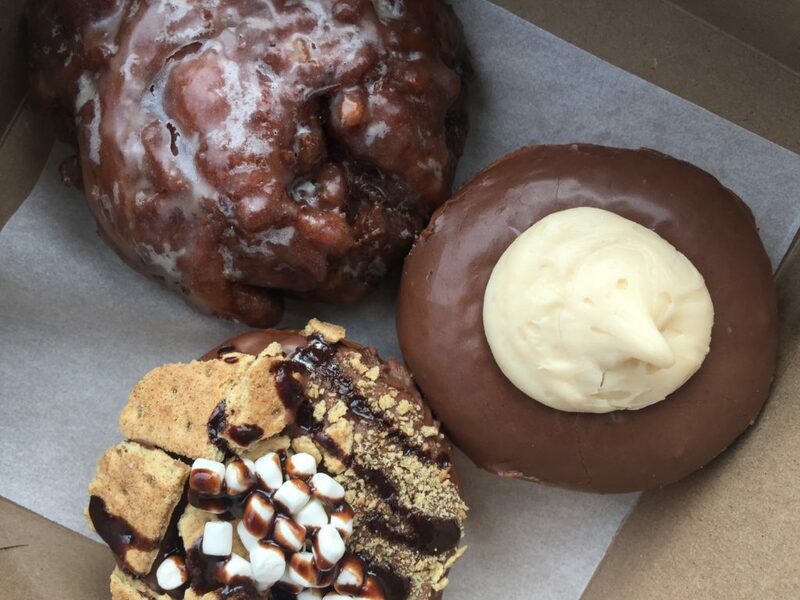 Check their social media pages to see where to find the truck and order ahead – this donut sells out fast! 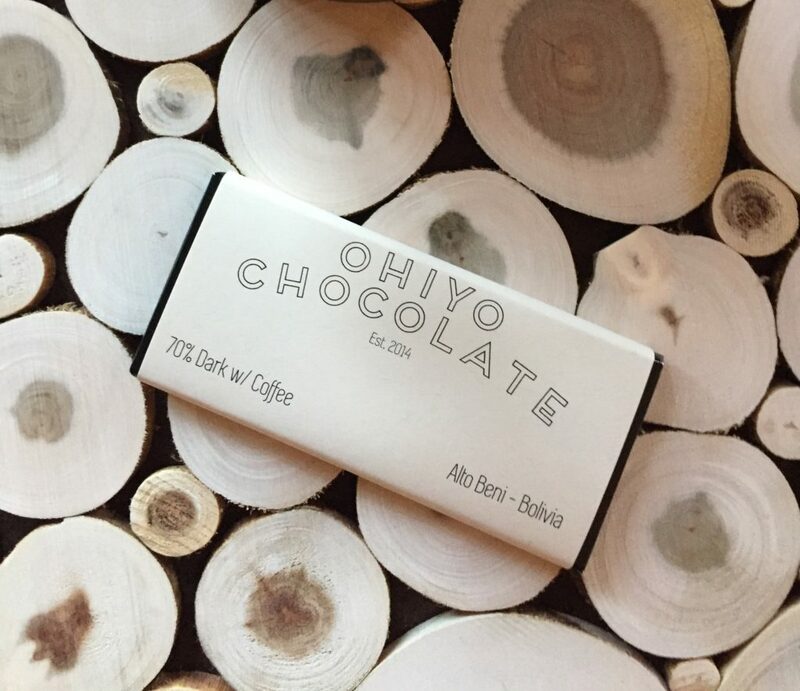 Crafted “bean to bar” in small batches, Ohiyo’s offerings will delight chocolate purists and adventurers alike. All kinds of chocolate are produced, with additions like salt, coffee, and sage, as well as traditional 75% cacao versions. Ohiyo also recently did a beer collaboration with Pretentious Barrel House, so be on the lookout for this chocolate beer combo too! You can buy the bars online, or I pick mine up at Wholly Craft in Clintonville. 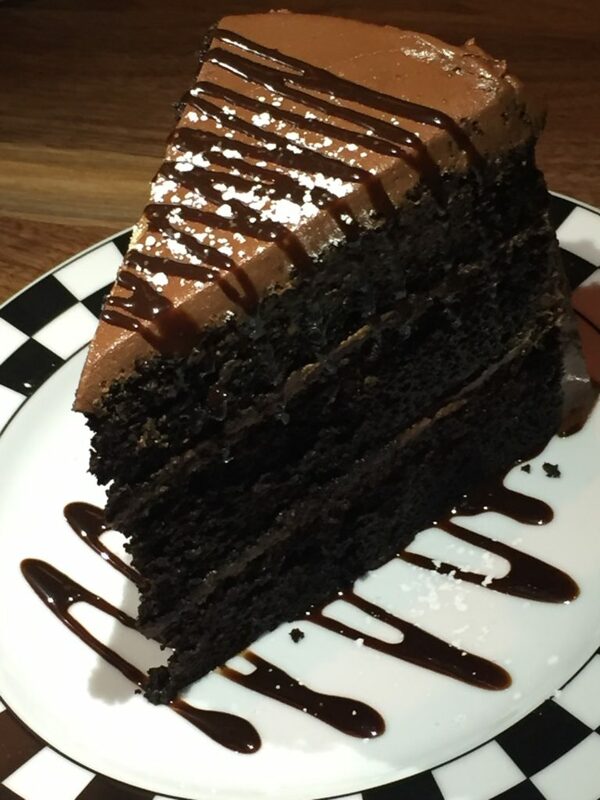 Who says you can’t have chocolate for breakfast? Every pancake ball offering from Katalina’s is utterly craveable, but if you haven’t tried the Nutella version and then dunked it in bourbon barrel maple syrup, you’re not living your best life. Gooey, warm Nutella oozing out of a bite-sized pancake is something that everyone must experience, especially with a side of spicy bacon. The German Village bakery’s Pain au Chocolat consists of a flaky, buttery dough wrapped around semi-sweet chocolate batons – simple and perfect. 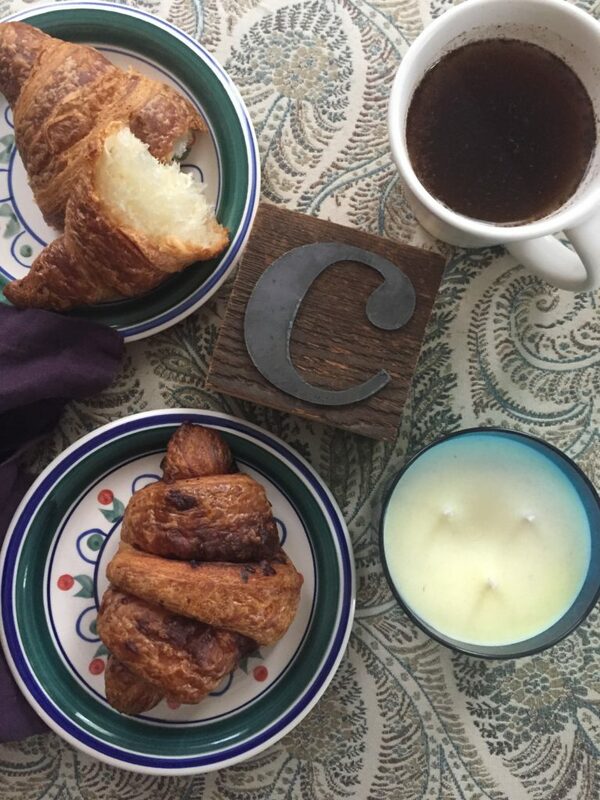 Make sure to microwave the croissant for maximum melt factor if you eat it at home! 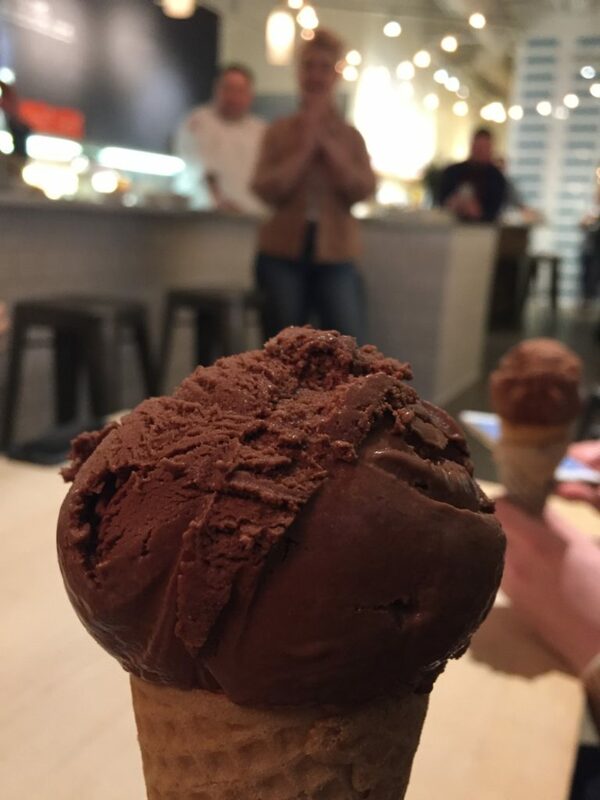 Wash your chocolate down with an iced mocha featuring Hartzler Dairy’s chocolate milk to get a double chocolate hit. 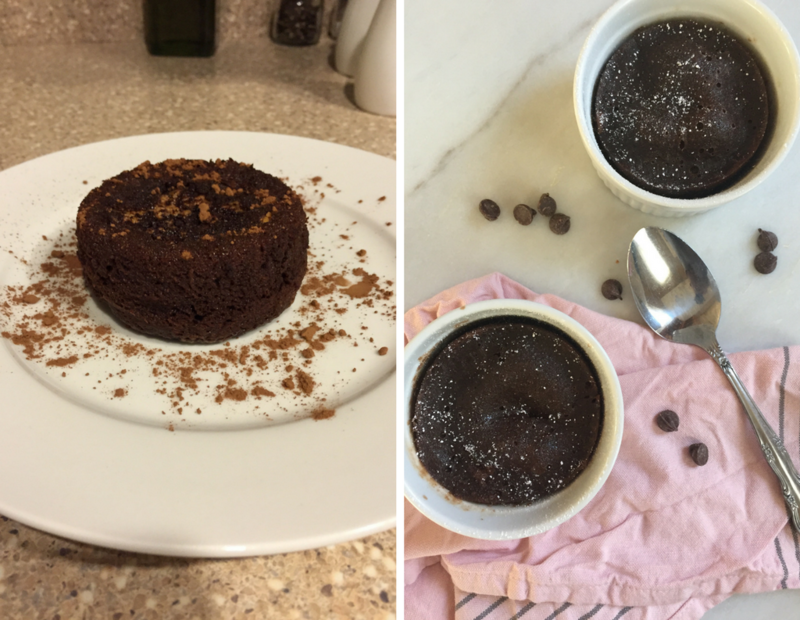 Want to bake a chocolatey treat of your own at home? 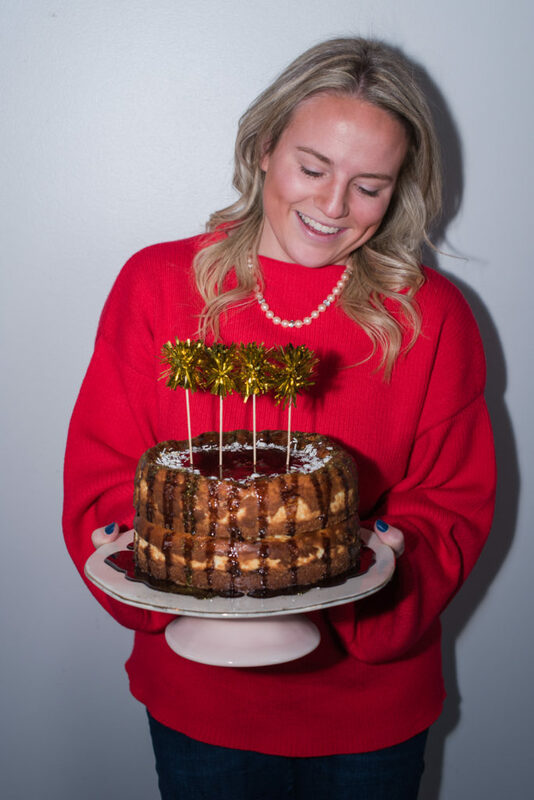 Check out these recipes from the blog: Top Secret Chewy Chocolate Chip Cookies and Magic Chocolate Stout Cake. Have another favorite cocoa goodie that needs to be included in Part 3 of this chocolate saga? Send me an email and let me know! I can’t seem to stop gravitating towards the new Bridge Park area in Dublin lately. 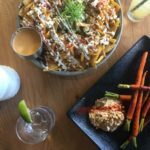 All of your local Cbus favorites appear to be popping up in this new complex: Local Cantina, Cap City Diner, Pins Mechanical, Fukuryu Ramen, and more. 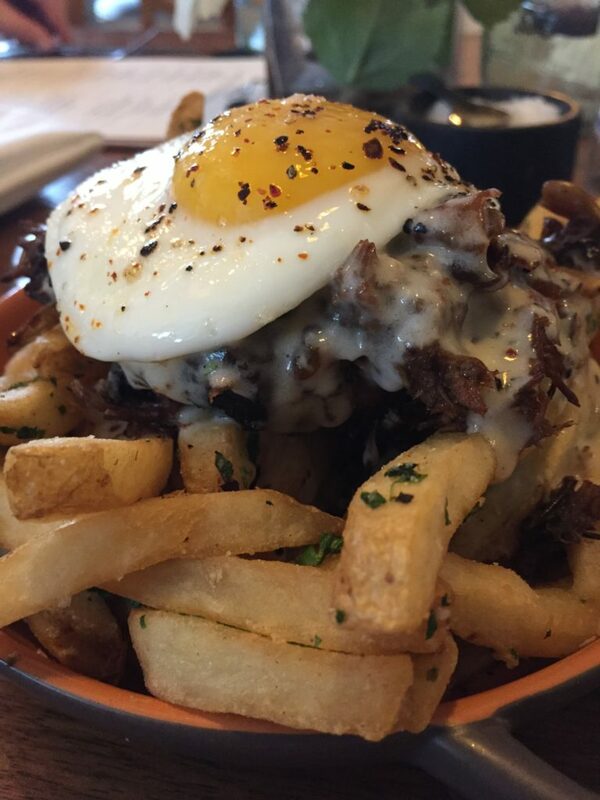 Go ahead and add Vaso to this mega-list, as my new go-to brunch locale. Perched on the top floor of the AC Dublin Hotel, Vaso’s lounge is churning out a Spanish-inspired brunch menu that will make you melt. 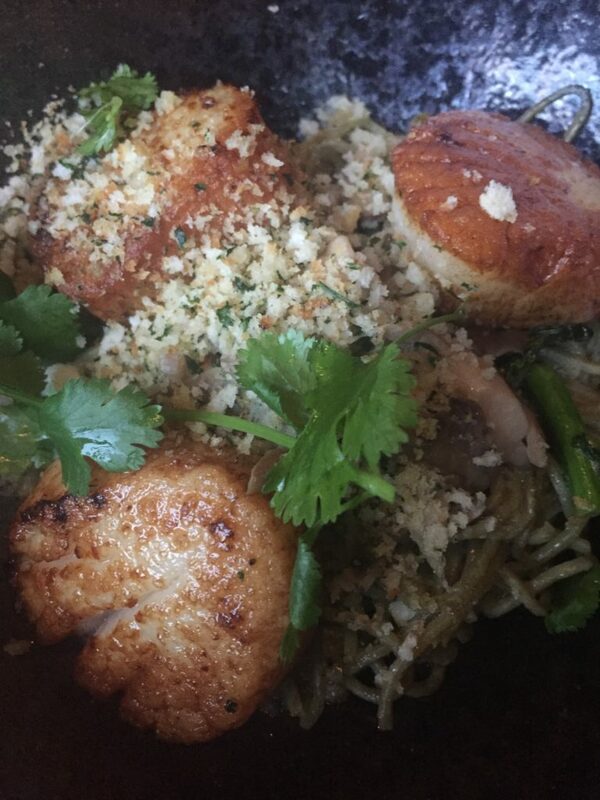 Every dish is familiar, but new ingredients and preparations will keep me coming back for more. I should also note that if you’re like me and obsessively photograph your meals, the glass-encased dining room makes it easy to capture Instagram-worthy snaps. 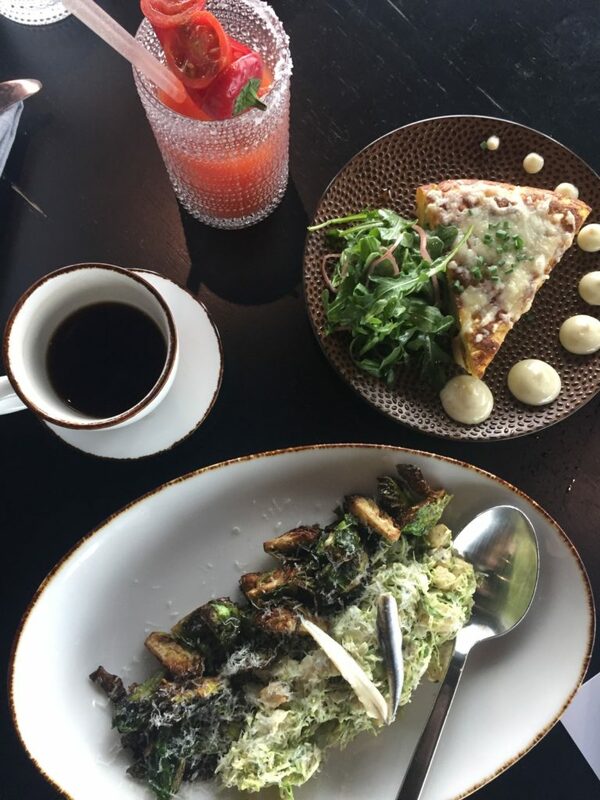 I also can’t wait to visit Vaso in the summer so I can enjoy my brunch on the enormous rooftop patio, filled with fire pits and an outdoor bar! Let’s get to the cuisine though. The chef here excels at sauce-making; every course I tried boasted a flavorful aioli, vinaigrette, hollandaise, or other liquid delight. The Tortilla Española, a Spanish potato omelette, had dollops of craveable garlic aioli and a lightly dressed side salad. The almond and red pepper-based romesco accompanying the fiery lamb meatballs was divine. I loved the Brussels Sprouts salad as well, featuring two preparations of sprouts: one raw and thinly sliced as a “Caesar salad” and one deliciously crispy and fried. Be gone, boring avocado toast – Vaso’s version has the addition of crispy peas and a drippy egg for texture and flavor. The shrimp flatbread has succulent shrimp, but also a surprising slather of white bean puree and tomato jam. 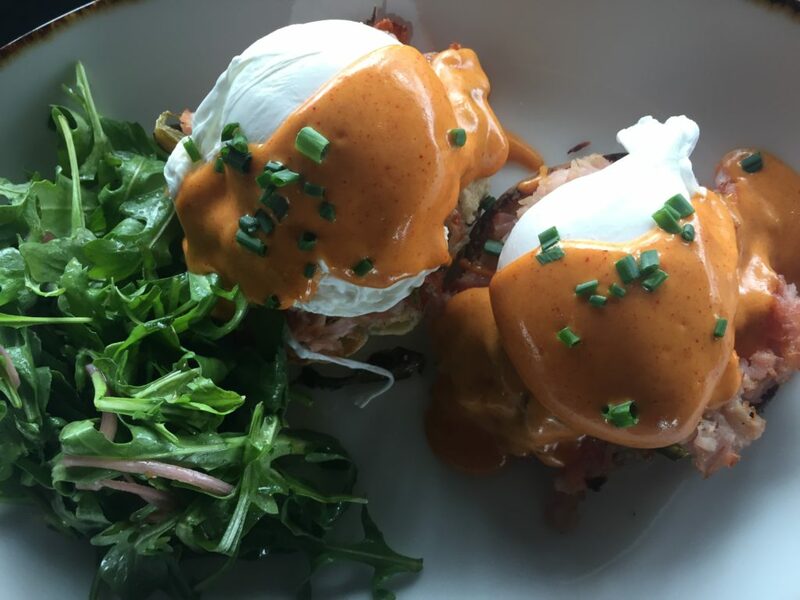 My favorite dish was the Benedictino del Sur, an Eggs Benedict redux consisting of an English muffin layered with ham, braised greens, and poached eggs, then topped with a generous ladle of pimento hollandaise. There’s even more to the menu, such as hangar steak, grilled octopus, and chorizo hash that I’ll have to sample soon. 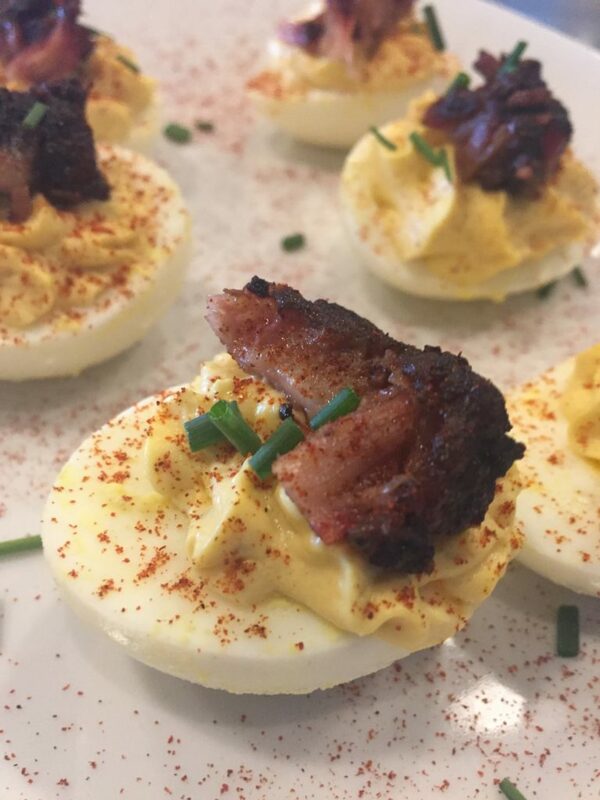 Wash all this fare down with some brunch-ready libations. I’ve never been a Bloody Mary fan, but I have to admit that I found the Red Snapper, Vaso’s slightly spicy twist, enjoyable. The use of house pepper mix, ginger, and Watershed gin instead of vodka made me a convert, in this case at least. Watch your drink being made live at the corner Bloody Mary cart, overflowing with fresh fruits and veggies. Traditional Bloodys and mimosas are also available, but my favorite cocktail was the Madrid Old Fashioned (Oloroso Sherry, simple syrup, lemon, and rum) all shaken up and poured over a giant ice cube with the Vaso logo, a nice touch. Culinary Clues: Vaso is also a stop on the Celtic Cocktail Trail. In this passport-style program, you can collect stamps for visiting select Dublin restaurants and earn rewards like koozies and t-shirts along the way. Additionally, Vaso is part of my 2018 Dining Bucket List; read more here. Disclosure: Vaso invited me to try their new brunch in exchange for an honest review. As always, all opinions are my own. One of the restaurants on this year’s dining bucket list that I was very eager to sample was The Keep. Having experienced a meal here, that excitement hasn’t waned. Nestled inside one of Columbus’ most identifiable skyscrapers, the LeVeque Tower, this swanky spot is the ideal locale for cocktails with friends or a fancy night out before a show at the Palace Theater. I don’t normally focus on the decor of a space, but the ambiance inside The Keep is worth noting. Every detail was considered in the design of the interior, from the torch-like gas lamps on the walls, the beautiful gold artwork, and the coves in the bar that are perfect for lounging. Just as appealing to the eye are the cocktails. 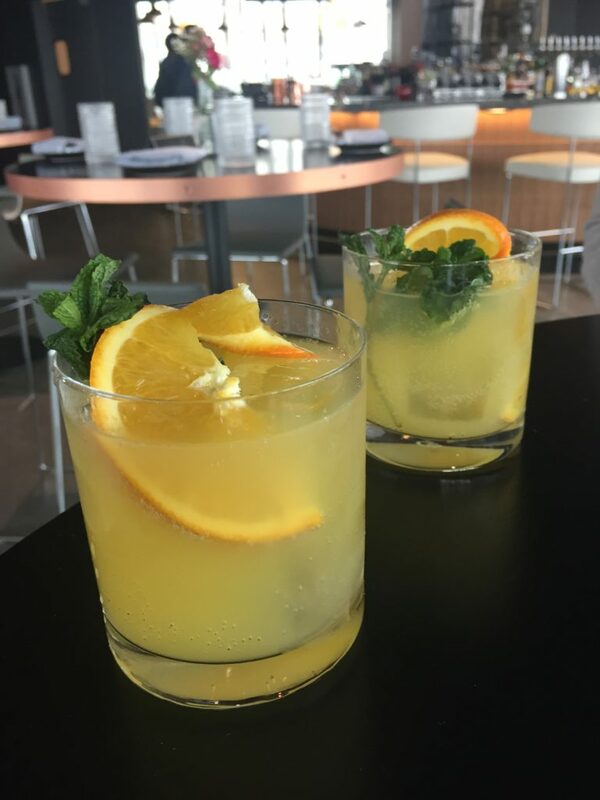 The LeVeque 75, a local twist on the classic French 75, is crafted with Watershed bourbon-barrel gin, bubbly, lemon, and simple syrup. As someone always partial to bourbon, I was also fond of the Keep-Easy Walnut Manhattan (The Keep’s special Maker’s Mark, nocino walnut liqueur, chocolate and orange bitters, vermouth, and a cherry) and the In Brasserie Fashioned (bourbon, St. Germain liqueur, and a bitters ice cube with an orange peel and a cherry encapsulated in the middle). The curated menu at The Keep has French leanings, and there wasn’t a dish that I sampled which I didn’t enjoy. Start with the tender Braised Short Rib, accompanied by the best grits I’ve had in awhile, or the pink-hued, beet-cured salmon with a pop of cranberries. For entrees, the Chicken and “Waffles” is a fun dish, a caper-sauced concoction of thin, crispy waffle-shaped potatoes atop breaded chicken. The Pork Cheek was another delectable selection, slow-cooked pork with collards, black-eyed peas, andouille sausage, and corn nuts for crunch. The Steak Frites were served up with an generous portion of craveable fries, and the scallop and green tea noodles had just enough sear and spice to be perfect. Our party didn’t have time to savor one of the signature Shellfish Towers, but next visit will have to include one of the heaping seafood platters overflowing with Creole shrimp, oysters, chilled lobster, ceviche, and smoked whitefish. I will have to return soon for beignets and the brunch menu too! Culinary Clue: Don’t miss a chance to sit at the bar around the open kitchen in middle of the main dining room. It’s so interesting to watch the care going into every meal as it’s plated.